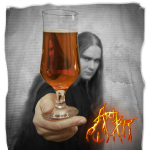 Archbeer.com is an independent informal site for beer enthusiasts, providing information on specific beer brands tested by guitarist Archaon of the Norwegian black metal band 1349. Wow. This incredible stout looks thick concistency, and judging by the aroma, it reveals a hint of soy sauce, cereal granules. And the taste, what is this like? Dried Fruit, grapes, sweet cherries and chestnut- all wrapped in a candysugarish malt- veil. The absolute beautiful balance provides to a long and full body, topped by a tingling sweet&sour head. Food- accompagny wise, this mukst be a perfect beer. At first, there’s a nice fruity aroma to it. This, followed by a comfortable entrè of delicious roasted coffee, mild smokey taste and fruit complexity. An easy- drinkable, good stout. This odd beer has a rather fruity aroma to it, followed by a nice tender introduction. It takes you through a mixture of herbs, spices and fruits- all around a nice malt body. The spicey taste follows all the way through and is somehow a little annoying, but all in all, it is good.